Q: How long before I receive my order? A: Orders are processed and shipped within 48 hours after receiving payment. (Excluding weekends and holidays.) Then it's up the United States Postal Service and any international postal service on the receiving end. (US orders are generally received in 5-10 days. International orders vary by country, but are generally received in 7-21 days but can take up to 8 weeks). If you are a US customer and have been waiting more than 4 weeks from shipping date, or an international customer and you've been waiting more than 8 weeks from shipping date, please check with your local post office and/or customs office and ask about a package from Dewey, AZ, USA. Q: What is your return policy? What is your satisfaction guarantee? A: If a item you ordered is defective or broken, please contact us within 7 days of purchase. Simply send us an email explaining the problem and we'll send you an email with return instructions. Return options include replacement of same item or, at store owner's discretion, exchange for another item or refund. We operate by the principle that we want you to be 100% satisfied. DVD?? ?s: We operate under the premise that we'll do whatever it takes to make you 100% satisfied. However, we won't accept a return or exchange just because you "didn't like the movie" or you decide you ordered the wrong title. You have just entered into a vast collection, gathered from all four corners of the Earth that has steadily grown since 1995. We are striving to become YOUR definite source of ultra rare films and media collectibles. Media Collectibles provides quality no one else can match. What defines us - rare, unusual, collectible, unique. What drives us - fun, memories, nostalgia. What makes us distinct - high-quality product, friendly and helpful service, fast shipping, product knowledge and extra value that others don't provide. We have had many, many happy customers all over the world and look forward to making you another happy customer. Harry Walker (Janssen), flies a traffic helicopter for a Salt Lake City Radio station. One morning he witnesses a bank hold up and the kidnapping of one of the tellers. Using his helicopter and his years of action as WW2 pilot, Harry pursues the criminals. 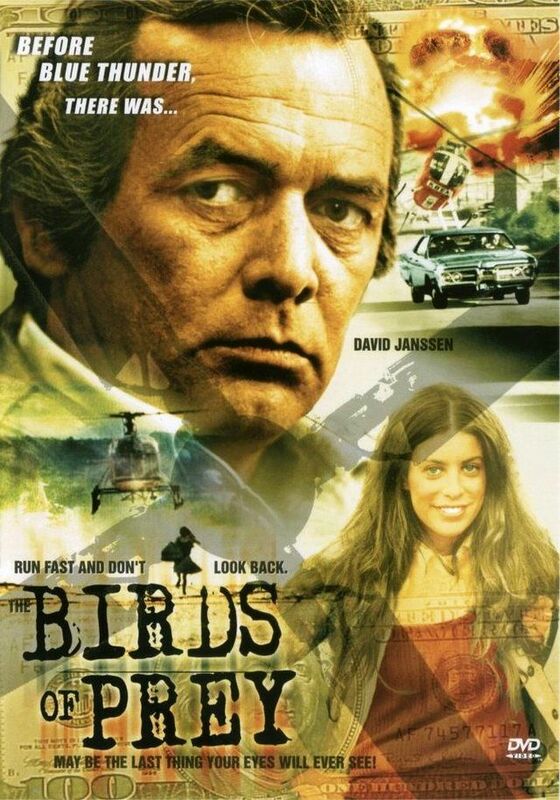 Janssen was a real pilot and flew these scenes himself! Life and death copter action plus the relationship that develops with the kidnap victim, are all reasons why I love this movie.